Celebrities hunt for antiques across the UK. 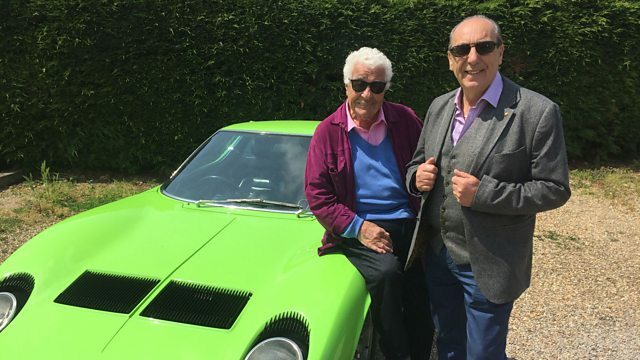 Top Italian cooks Antonio Carluccio and Gennaro Contaldo are on a road trip around East Anglia. Browse content similar to Antonio Carluccio and Gennaro Contaldo. Check below for episodes and series from the same categories and more! top cooks Antonio Carluccio and Gennaro Contaldo. is for asparagus and also mussels. Beautiful, yes. They sell lovely mussels. roaming the East Anglian countryside in search of antiques. Plus, of course, their more usual stock-in trade. -Oh, look, look. Down there, look, look! Can you imagine a lovely broccoli with spaghetti? All the rapeseed - it's so good. Foraging comes as second nature to those two chums. Oh, yes, you cooked the spinach. Well done. ..even mentoring one of our own. But he certainly appreciates a pukka '60s Italian motor when he sees one. Can you imagine having this car when this car was first coming out? and all these beautiful girls. Do you think you needed this car here to pull girls? will be joined by a pair of equally enthusiastic expert. I cannot believe we're driving a Lamborghini Miura. -What is this, '60s, '70s? to loan it to us for two days! They're crazy! is our two Italian chefs. of this revolution in British cuisine. with our cooks more than happy to fulfil their part of the bargain. We can work through the stomach of those experts. We have to cook well. You have to cook well. I am the mind and you are the tool. Did I mention their somewhat tempestuous relationship? More on that later. But first, two Italian classics in a Norfolk field. Not all the Italians are like this! his old friend will be travelling in the Iso. How did you and Gennaro meet? At the time I was known to be the Mecca for mushroom eaters. And one day came Gennaro with a basket of wonderful porcini. And I said, "My goodness gracious me. "This is for me?" He said yes. And next day he came with another basket. And we haven't stopped one single minute. Many years go by now and we are so close, it's incredible. -Not that the competitive urge will be lacking. His expression - "Yeah, you always have to show off!" £400 each, and may the best cook win! By the way, where are we going? to an auction in the Norfolk market town of Diss. there was a thankfully thwarted uprising against strangers. There must be a name for this yoga position. Lotus? I'm sure you'll get used to leaving the Lambo. -How do you do? Charlie. -Gennaro. How are you, Charlie? Are you all right? So where are the bargains, Charlie? Near the back? I think they're this way. Much as the name implies, there's an awful lot in here. -don't you? What do you call that? -You call it a white? Do you know the story, it says "Naked Chef"? because he's naked, got no clothes on. and puts his ordinary clothes on, he's no more a chef. He's missing his finger there, isn't he? But for a shop of this size, a bit of a plan might be in order. and we'll compare bargains, shall we? OK, let's have a look. Let's have a look. -I'm going to start from this side here. You never know, you might find something underneath here. Spoken like a true forager. Those two have the makings of a very good team. All over this place like a proverbial rash, eh? There's so many bits and pieces here. Look at this one. This is hand-painted. What do you get for £1? I think pictures may be more Gennaro's cup of tea. -Oh, I love this one. A monk. Don't forget in the convent they used to make their own wine. So he goes round to taste the wine. Put a bottle everywhere. He's drunk and joyful. That's really good. And look at the face behind! "What he's doing? He's drinking all the wine!" Downstairs, James has a bit of a curiosity. I think it looks like a chamber stick. It's certainly got age. This rather nice ring handle here with a nice sconce. into England from the Navy and all this trade. to form a chamber stick. I think this is a real candidate. and we'll find out the price together. Just hanging my washing out. What a very fine pair of legs you have. I think I've found something that would interest you. All right, let's have a look. I'll just come down. Look at this. Look at that. -The feeling of this one is incredible. Unusual shape. You know, I've never seen a shape like this. But it is a proper one. I like the fact that it's still got that colouring. so it's paid some duty here. -Have we got a date letter there? -We're going back so long. Maybe like a little chamber stick or something. -I love it, as well. It's mine, you won't have it back now! -I could let you have it for a good price. It would have to be £60. It's well worth £60. £60 would buy a car! -Have another feel of it. You see, Charlie's a salesman, he put it straight in your hands. -I think we've found our good cop. Listen to me, I need a bargain. And no prizes for guessing Gennaro's role. I'd let you have it for 50. -And that is a really good price. I just love it, you know. It's good, 50 is a good price. What about if we split, we go 30? Look at me. You can't say no to me. How about our other pairing, then? Isn't it just the most delicious Italian dream? It's a delight to drive in a dream, actually. Do you know what we were doing when we were young? closing the eyes and guessing which kind of engine was passing by. and to meet a certain Alfred Corry. -John, lovely to meet you. This is my friend Antonio. She is now 123 years old. it was manned by volunteer local mariners. There were a lot of fishermen in Southwold. The beach was covered with fishing boats. So they had plenty of choice to pick out men. 20 years old, in 1848.
and was very soon made coxswain. So your great-grandfather knew this very boat? He knew this boat right from the start, yes. on its design by the RNLI. and a lifeboat that they didn't? Some of them were self-righting and some of them were not. Why did they like a lifeboat that isn't self-righting? It comes back very quickly. Those that aren't left behind are thrown out the other side. -And this is what they didn't like, and it had happened. they were perfectly capable of keeping them upright themselves. having won three RNLI gallantry medals. before being replaced by a motor-powered craft. Do you know, by any chance, how many lives she saved? and in that time she saved 47 lives. In actual fact, of course, there could well have been more. John discovered her in a perilous condition almost 60 years later. I don't know if you remember the year of 1976. It was a very hot, dry summer. I remember, it was a wonderful mushroom year. A very hot, dry summer. she was filling and emptying every time the tide came in. She was in a dreadful state. And my wife and I decided we had to do something about it. housed in what was once the lifeboat shed for nearby Cromer. bringing her back to her former glory. You must be incredibly proud. Well, I'm very proud and very grateful for an awful lot of help. which was set up by the trust. And now you've donated the boat? The boat was donated to the trust, yes. that you gave a piece of history life. -It's very nice to be able to do it. Back inland, the mood in the Lambo is decidedly up. Everything to do with old is beautiful. But you know what? I really, really like to win! and very close to our eventual auction destination. I think they got away with it. Nice place Danielle and Simon have here. Goods from a similar era to the Lamborghini, possibly. if we had to do an average of the contents of this huge emporium? Mid to late '60s would be the average. -Yeah. I would say so, yeah. -I don't. No, I was at school. Crikey! He's quite wild now. Hey, let's go to the battle. What does James make of his brother-in-arms? He's a clever man. He's got a good eye for things. Gennaro does the talking, I do the listening. And he's no mug, either. James, this is from Antonio's hometown, Amalfi coast. Do you see this colour? This is the Vietri colours. The place where really make a terracotta. I believe this was made more for water than wine or anything else. Amalfi lemons, always beautiful Amalfi lemons, it's good. -I think we're going to forget about it. -That's what they said last time. Let's have the proprietors in. Gennaro, can you get me a lemonade? Limone? Senza limone? Con limone. Right, come on. The nasty question of price. It's 45, because one has a little crack in it. I think probably 30 is probably what we could do. I think the most I can do, honestly, is 20. I think you can do it. Come here. There we go. You know the price is going up with this. I wonder how his old boss will fare on his first shopping expedition. Do you know, in Italy, you're always prepared to negotiate? It doesn't matter if they ask ten, you have to ask half of it. -Hello, I am Antonio Carluccio. -Niceties completed, what catches your eye? It looks like very interesting, this one here. This is very fashionable, mid-20th century kind of industrial pieces. It's been stripped of all its colour and then highly polished. -It certainly would have been painted. it's ready to go into a house, not for an auction. No. You think that if I could get the price down to half of the price? Oh, my gosh. Well, I can hear some chuckling from that direction. Kate is a lovely girl. He and Gennaro have similar techniques, I'd say. -..and I can see that it's missing its escutcheon. I can tell you that the handle is original, can you see? -Yeah, yeah, yeah, I can see. -That has worked for generations. My goodness. Just like Sherlock Holmes. -He was a bit of a know-it-all, as well. What do we English love to do? This is the kind of thing that auctions love. -Shall we consider this for...? -You need to guess how much it is. -A little profit in it. -Time to test those negotiation skills. And you're a very poor man. -I'm a very poor man. -I've heard it all before. I see a price there. -Standard trade is two, really. 16 and it's a deal. -OK, 16 is a deal. First purchase. Thank you very much indeed. What about back in Beccles? -Can you pick him up? -And crimped round the edge. I can serve a beautiful suckling pig on top of here, lovely porketta. Two people bring him out. Actually, it is quite nice. -Look at the base of it. -Oh, my gosh. They're closing? They close, yeah. They're sort of folding. you can fold them up and take them away. And this sort of looks Scandinavian, doesn't it? And then you put the tray on and then it makes sense, doesn't it? Yeah! It actually is steady, look. It's sort of potentially free, this item. Can you tell us about this amazing tray? It's a fantastic little table, Scandinavian. and I picked it up at the weekend, and they're very good sellers. So definitely not free, then. Once done up, round about probably 165, 175. I find that extremely expensive. -Yeah. Nice one. Yeah, I mean, it's negotiable. -I think it's James' turn. I'm not going to be able to get near 40, 60, really. I could pretend I never bought it for £75. I don't know. It's very difficult, isn't it? Now, what are they cooking up? I'd love to touch hands around 60, 70. If you made it the upper 70, then we can do so. -I was going to give him less. -Do you want a job in the restaurant? plus a jug and tankards to put on it for £90. Is there no end to their talents? Ah, shaddap a you face. -What are they made from? I don't know which material is this. -Do you think it is Bakelite? -How old do you think are they? They've got some age to them, actually, haven't they? -So, you know, Art Deco, 1925 to 1939 is really the period. -Priced at £55 for the pair. -Yeah. In a mould, and put together. that these things have been mass-produced. -They were presenting an image. It's the look, isn't it? The metal itself is spelter. -Yeah. It's a poor man's bronze. -..bronze on black marble plinths. I'd want to pay £20 for them, and I think they'll make a bit of profit. -But they need to be 20 quid. -He's enjoying this, all right. I mean, worth it, probably, ten quid each? -I couldn't spend more than that. -How much can they be? -They're 55. He's only got trade five on them. We're not going to do it, are we? I was thinking ten, 12 maximum, really. -This is the last offer. It's my son. I have to tell you the dealer is my son. -So I might be able to twist his arm a bit. -Do you want to give him a call? Yeah. I like the colour and I believe to be Chinese or something. They would need a little bit of care. Do we like that, Antonio, the fact that they need care? they don't need ready-to-wear things. -And it is a pair. because they are not exactly a pair. a load of other bits. They're 40 each. That's £80 for the pair. Not a lot of money. Can I just interject a little bit? -OK, I'm going to leave it to you. -Because I believe that we can do that. This isn't going to take much time, our shopping trip. -No, pretty much off the cuff. So, how about the Art Deco for £24? Go on, then, Kate, have you spoken to him? He's my son and I did twist his arm a bit and he said yes. -I think you've got a real bargain. OK. Were you meant to look at me at that point or not? -All right, slightly late, but not to worry. Get used to it, David. £100 for the caddy, the figurines and the stands. We couldn't borrow a bit of beeswax, and when I say borrow...? -I was going to say, he's pushing his luck now. -I think we're all a bit tired. It's been a long day's shopping, after all. So, time for old friends to reunite. Thank you. How do you know that? And my hair is all right, yeah? Next morning, our experts are keen to compare cooks. Antonio is an amazing person. He's one of these people that has an aura about him. -He's very wise, isn't he? a wild monster that you cannot control. Gennaro is a great negotiator. Everybody feels as though they've been joyfully touched by him. ..meaning they still have 300 left for today's purchases. How many...? You bought the lot? Fair enough. We bought three as well. -Tell me, don't worry, I won't tell anybody. Antonio's keeping mum. Quite right. As for James, he's just happy to be driving a V12. Just wants to go, let's stop fannying around. Well, don't forget to meet your celebrities. Have a good day, see you later. -What is Italian for "good luck"? -You need it. You need it. -The only luck I need is to get in here! but our first stop today is in Suffolk, at Thorpeness. Now, what's the mood in the camp? What about if we lose, which I don't believe...? -He is going to explode. He is going to dance the tarantella with his walking stick. James Braxton and Gennaro, they're very competitive. We can be competitive, as well. We can be competitive, but I think we're a bit more laid-back about it. and an extremely shallow Peter Pan-inspired boating lake. -Oh, look at this here. These two have plenty of cash left, of course, but what to spend it on? Not very much my taste so far. -Are you showing me something? -To pick up your coal. -Pick up your what? Oh, your coal. Oh, I say. That's a very posh bit of kit, isn't it? -When I pick up coal, I just use my hands. Not with those trousers, surely. You could use it for all sorts, couldn't you? Well, I wonder what will grab them. -Can I show you that? There we have the one piece that I really, really love. -I like it as well actually. -This is a wacky one. You'd describe it as a mannequin but it's articulated. -Gennaro always does like this. What does Gennaro do? OK, let's do Gennaro. OK. Wahey! What do you think would be a possible customer for that? Clothes shop, particularly a vintage clothes shop. Well, how do you put a price on that? It's a lover's price, somebody that loves it. and then what's it going to make in auction? Who knows? Tell me a bit of history of that. I was thinking very reasonably priced. What would you call reasonably priced? Reasonably priced would be half at least. That would be pushing it quite a lot. We're all Italians now, it seems. -Am I doing it well? I think a value of about 45 would be fantastic. Goodness me! I think I might have to sit down. Just relax, you two, why don't you? It's a wonderful way of talking business. How long does it actually take to do a deal in Italy? -I'll give you an offer you can't refuse. Oh, wonderful! Linda, you are fantastic! Now, that just leaves one last thing. Now you know how to put a body - a real body. Something tells me the Lamborghini isn't quite so practical. -My hat fits me nice. Look! You'd look very Italian. Quite sinister, in fact. has come to visit one of Britain's finest bird-watching destinations. Very quiet, let's be very quiet. Go on. Get out, James! I think I'm a long-legged wader. Remind me, how does the bittern sound? rare great bitterns are at Minsmere. Very eerie. Watch out, Gennaro, they're approaching! in the company of the RSPB's Ian Barthorpe. -Nice to meet you. How lovely. owes its existence to World War II. So, this is the wartime defences here at Minsmere. to stop the potential German invasion. and some sharp metal spikes, known as dragon's teeth. That was to stop troops from landing. to stop tanks from potentially being able to come ashore. with what they called coastal crust. The Germans never came, yes? even creating a second line of defence. actually landing on this stretch of coast. -And the great beneficiary of this all has been nature. Absolutely. After the war, the sluice is operational again. The water level has receded. we found the first avocets nesting in the UK for 100 years. And how beautiful the avocet is. It's an incredible bird. Do you know, I've never seen one, I don't think. I think we should see some. -and we'll see what we can spot? We're lucky enough to have a couple right in front of the hides. We can see them really, really well out here. The avocet's just a fantastically elegant bird. It's black and mainly white plumage. A long, thin bill and incredibly long pale blue-grey legs. -Could they be a pair? They could be a pair. Most of the pairs at the moment are paired up and are nesting. and the second bird out feeding, and then they'll swap over. thanks, in part, to some interesting negotiation techniques. -Italian life, it's a little bit sort of playing theatre. And you have an applause when you look each way. Last chance to tread the boards on this trip is at Yoxford. -Yes, good to meet you. -Nigel, lovely to meet you. -Welcome to the Yoxford Antiques Centre. Big too. Enough to accommodate a bit of a bit of a British classic. Loving the Riley. It's not actually a car, is it? It's not a car any more, David. No, it's been preserved as two sofas. Good thing there's plenty of room. Just as long as there isn't anything here they might fall out over. This is a primitive sort of food processor. So, for churning and anything. I'll teach you a thing, Gennaro. Open van, let's get to the dealer before he even gets it on his stall. This may be fresh to the market. Good plan. Keeps them apart, too. -Tell you what, I like that. Rural Norfolk loves tractor seats. -That looks good, doesn't it? Good. That's what we like. I'll leave you with the muscles. -Oh, gosh! I quite like it. Ransoms. Ransoms used to make mowers. Maybe this is a mower seat, or maybe they made tractors as well. I like the fact it's got the bracket. They must have had tough old bottoms, mustn't they? But I tell you what, Gennaro, that has Diss written all over it. Let's have a look, if I can sit on top. the others have some silver in mind. -The shape itself is very unlike a teapot. something that really sums it up beautifully. That tells you the quality is good. The shape is so incredibly fashionable for 1890/1900. But to people who were really bang on-trend. Yet, the decoration around the top there is very traditional Victorian. -So, it's a halfway house. -It's united the two things? Yeah. That's the original handle. -With a nice wicker handle to protect yourself from the heat. It just fits and works perfectly. It's priced at 50 quid. -It's no money, is it? -Might go with the caddy. we've just walked past. Keeping on a silver theme. Oh, wow! What is this? It looks just like a plain box. But in this business, you've got to be a bit of an investigator. So, we look at the top first of all. And you look at the wood. That's English oak. Good, quality wood. So, now we open the lid. The interior now tells us pretty much everything we need to know. A chest made specifically to carry silver cutlery is pretty upmarket. -You've got these different trays. Lieutenant Colonel Dewend, West Riding Regiment. -So it's a military campaign chest. So, this guy was going probably to war. He was dining rather well. but he was eating it with silver cutlery. No sign of a price but it's probably not cheap. Ah, the van driver's pitched up. What can I do for you two gents? We quite like the look of this. Tell us about it, Jeff. It's an original cast iron Ransom's tractor seat or lawn mower seat. I know Ransom's well from lawn mowers. They're more famous for lawn mowers. -But they built tractors as well? -They built tractors as well. How old would it be? I would say it's probably 80-100 years old. 80-100 years old. It must have been a lot of bumps to sit on. I wonder what price Jeff has in mind. You tell me where you'd like to be? -Before we start a fight! I'm not liking what I see. Can we have it £15, one five? Course you can. Come on, you can. -Less grand opera, more Big Daddy. Even when I'm by myself, I try to make a deal, he had to come out. Two objects that we are interested in. The plated teapot and the campaign chest. Probably sneak just under £100. -95, David, I would think? -When do we do that? -Oh, yeah, and my children won't eat. It's far, far too much. 80 would be good. OK, hold that thought. Hold that thought. Let's see if we can do a double deal here. What about the teapot? Well, the teapot is easier, really. It's got £50 on the ticket but it's been that a long time. Oh, that's what I was thinking. 20 plus 80 is 100. How about 20 plus 90 and then we've got a deal. It's been working. The whole trip, it's been working. Gennaro and James have one last purchase in mind. It's got a great look, hasn't it? Useful item and its tomorrow's antiques. but I think it was quite keenly priced to begin with. -That's quite cool, isn't it? -I didn't know what is this. I love all this metal. I don't know. It's something and nothing, isn't it? on our lovely tractor seat. Bit of a squeeze in the car, as well. It's good but I don't think we can afford it at that price. I think it's a lovely piece. OK, listen, shall we shake hands? You want 65, let's make 60. 65. I can't do any more. Sorry, Gennaro. -I can't win them all. So, with that little deal done, it's time to share. -Shall we take them out of this? This comes from Vietri sul Mare, the town you were born. I recognised the kind of terracotta. Look, it's all handmade. Everything. -A little stick, isn't it? Candlestick? -with an exotic shell underneath. I do like the trolley. Mid-20th century, maybe a little earlier. Well, that's all very convivial. -OK, you reveal this bit. I shall reveal this bit. -OK, there we have it. Any questions? Is this a famous fan dance? That's the purpose and this, this is the wonderful thing. Accompanied by this special sort of teapot. They believe they have something very special. That beautiful shell with the silver. I just love it. Everybody would love to have it. -Antonio is going to cry. Unless it's over the onion because our cooks are stirring up a treat. -Shall I put it with those? -Yes, put it in, yes. The mind and the arm. Now you can put the rest. Here, there you are. And a little bit of salt. So now is the time to put the mussels in it. There you go. Open Sesame. You make the most amazing team. To watch you is an absolute privilege, isn't it? I love it. Do you know what? I love it. David, we're still going to beat you. back in Norfolk at Diss. Now leave it, my goodness. What do you mean, leave it? You know, there's my age. -No, no, it's not your age. Listen. It may be that we break down in the middle of the country. The car is not break down. This car is made for go. Yes, this is Diss, capisce? -Are you ready for the battle? makes of what our cooks have collected. Nice part of Italy they're from, I believe. They will either fly away or we will struggle with them. and I think we may be surprised with that one. Brass tray on stand, probably a marriage of pieces. The brass on top of the Swedish-style base there. I'm sure someone will have it. Now, everyone on their best behaviour, please. You'll be lucky. Have you been to an auction before, Antonio? It was auction of my own stuff. We start with Gennaro and James' rusty seat. 40 I'll take then and go, £40. Move it away. It's got to be 30, then. Start me. Ransom's tractor seat. 30 bid. Thank you. Take two. £30 I have now. Is there two, anyone else? 32 at the back. Take five. I'm out. £32 bid in the back corner. Doubled their money, if not quite the flying start they were after. If it's rusty, we're all over it, OK? And leave the Art Deco ornaments to Antonio and David, eh? Start me straight in. Save my breath, £40 anywhere. 30 I'll take to go. 30, gallery, thank you. 30 bid. Take two. £30 I have. 32, 35. Oh, that's OK, that's all right. Hey, we're getting an applause. The roar of the crowd, eh, David? I am very worried about them. Well, they're grinning. I've been worried about them for two days. That's a confident shrug, Gennaro. Must have high hopes for the brass table. Let's start me on this one on £40. Nice little brass-topped table there. 40. 30. 20 to go then, surely. -Little table there for you. £20 bid to get off. 20's on the net. Take two. Give me two, anyone else. Surely. Antonio, is it going to be a loss? It's online. £20, any advance? I think sportsmanship's already out of the window. The little profit that you had before is all gone. Next we have Antonio and David's joint tea-related lot. 30 is bid. In the front. Take two now. £30 I have now. Antonio, tell them, do something. £45 the bid in front. Take five. Anyone else? It's £50 the front bid. In the room at £50 in front. We will sell. Now, let's change the mood with that nice Italian pottery. Will he bid for it? Don't worry, I'll say that. You should bid. Look, if you do, I'll give you a card. The Italian Vietri sul Mare. -I hope I pronounced that right. Lovely set there for £40, surely. Take 20 then and move it away. £45, the bid in front. -Must be your connection, Antonio. Any more? 45, it is. Any advance, then? It's going to go. -Well done, well done, guys. That you are losing it? So far we have profit. Yeah, but it's for next. the very good wine is always in small barrels. So, expect another perfectly formed profit for their Chinese stands. I've got interest on these. 60 is bid. Five anywhere? The stands are there. 60 bid. Five, 70, five, 80, five, 90 bid. At 100 off to the left. -This is working, this is working. -Is there ten now anywhere? Big bucks, but there was a certain celebrity waving the rules? Because he goes with his hands like that, he gets people up. They could do with a profit on the chamber stick, though. -Chamber stick. 30 bid. Take two. Take 50. £48 I have. 50 now. Surely more on this at £48 I'm bid. 50 anywhere? Any advance then at £48? They thought they were the winner. They could be yet, but time is running out. and when it's over, I don't want to know. Well, you may not want to watch theIR next lot then, Gennaro. I've got interest straight in and we're going to start 30. Are Italian auctions like this? People will see you and buy because it's you. Surely now the mannequin at £50. Oh, it's a working profit again. He looks pretty calm, at least. something really on-trend at the moment is trolleys. -It is not cheap stuff. it could easily have featured on The Sale Of The Century. Stylish piece. Start me at 60. Start me on this. 40 I'll take. £40 surely for the trolley. -No, make it a tenner. 30, we're in. 32 anywhere? -Oh, that's enough for a hostess trolley. £45. In the room at 45. I think the wheels have just fallen off Gennaro's wagon. I've never seen Antonio smile so much. No, because it was your piece de resistance. It's not quite over but there's a lot riding on the final lot. Antonio, this could be us. -No, no, no, I just want to get this. Sit down because you're not allowed! oak and pitch pine fitted campaign silver chest. It's in the room at 35. -Yes, come on, come on. £50 in the room, then. Any more? Surely more on this. £50 bid. Five, I'll take. I'm trying at £50 bid. Take five. 60 I have. At the back, £60 now. Are you five online? I've lost the internet then with £60. It will sell at 60. Celebrity endorsement doesn't always pay off. Their only loss leaves it close. Let's go and work it out. but they're still today's victors with £395.10. I am so sorry, I am so sorry. I won't cook for you any more! Gennaro, don't talk any more. -It's all going to be good news. He's going to be magnanimous in victory. No, he won't be, he won't be. Gennaro, you have a hell of a journey ahead of you. Something tells me our two tenors aren't done yet. What is the Italian for Schadenfreude? Gennaro, that was the example but I wanted to give you. there is somebody superior to you. Superior?! But for people who buy rubbish, it's not our fault. We had the quality stuff. Top Italian cooks Antonio Carluccio and Gennaro Contaldo are on a road trip around East Anglia. Restaurateurs, writers and old friends, the 'greedy Italians' forage for antiques in the company of experts David Harper and James Braxton. Watch out for some explosive bargaining and an extremely tasty risotto! When he is not shopping, Antonio learns about the brave fisherman of Suffolk, who saved mariners' lives while risking their own. And Gennaro has a trip to take a peek at a very special bird.